Second try. 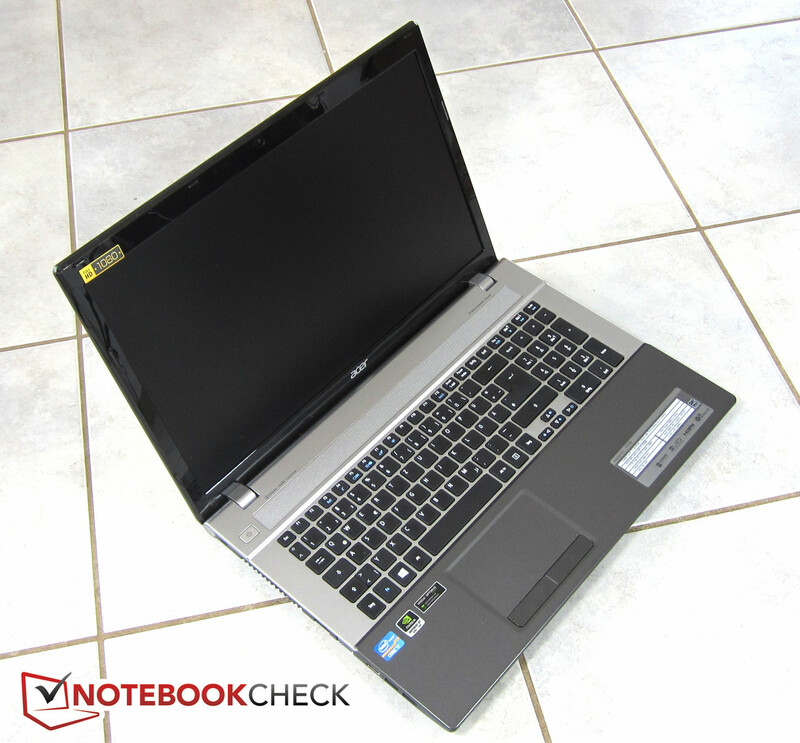 Although the Acer Aspire V3 was designed as a multimedia notebook, the first test model did not come with a Full HD display. Now, the manufacturer has fixed this shortcoming. The nearly identically equipped successor features an adequate display. 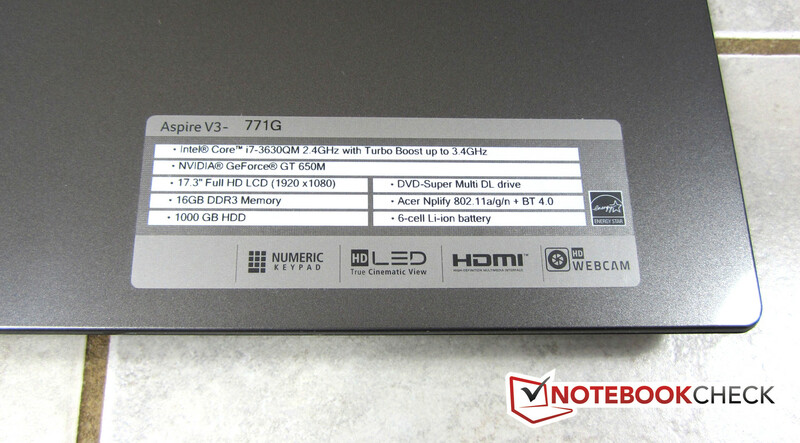 In June 2012, we scrutinized the Acer Aspire V3-771G-7361161.12TBDCakk. With an Intel i7-3610QM CPU, an entry level quad core Ivy Bridge processor, and Nvidia's GeForce GT 650M GPU, the 17.3-inch laptop was designed for performance-oriented customers. In addition, the model also featured a Blu-ray drive, 16 GB DDR3 RAM and two mass storage devices: a 120 GB Intel SSD SSDSA2CW120G3 as the boot drive and a 1000 GB Toshiba MK1059GSMP. 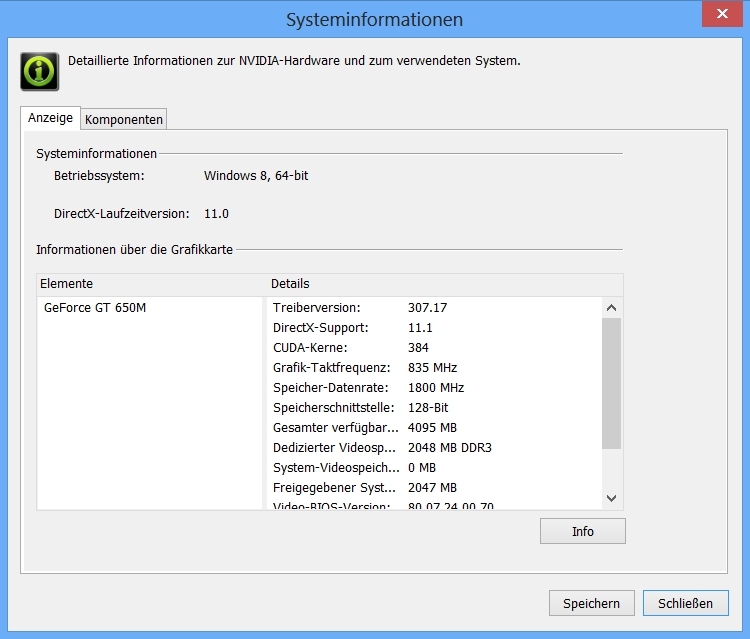 The CPU and GPU of the completely black Acer Aspire V3-771G are still excellent for multimedia purposes. However, there are several points of critique. We did not like the sensitive high-gloss surfaces, that all the interfaces are inconveniently close to the front of the sides and the HD display (1600x900 pixels) with modest contrast that did not support Full HD. 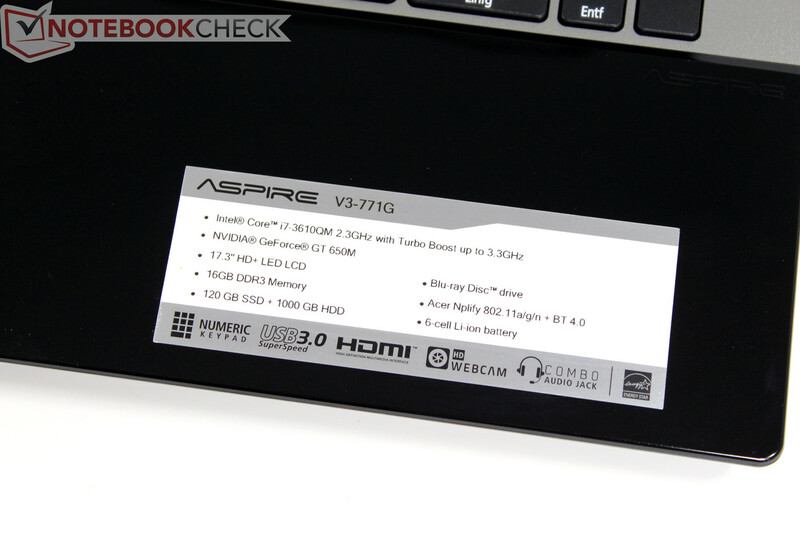 A further model of the Aspire V3 series, the 17.3-inch Acer Aspire V3-771G-736B161TMaii features a very similar CPU and GPU combination (Intel i7-3630QM instead of i7-3610QM) as the V3-771G-7361161.12TBDCakk, but comes with a matte Full HD display. In addition, the test model no longer has a piano-black finish. Further differences: Instead of an SSD and HDD combination the V3-771G-736B161TMaii only uses a single 1 TB Toshiba MQ01ABD100 hard drive and instead of a Blu-ray drive it features a conventional DVD burner. 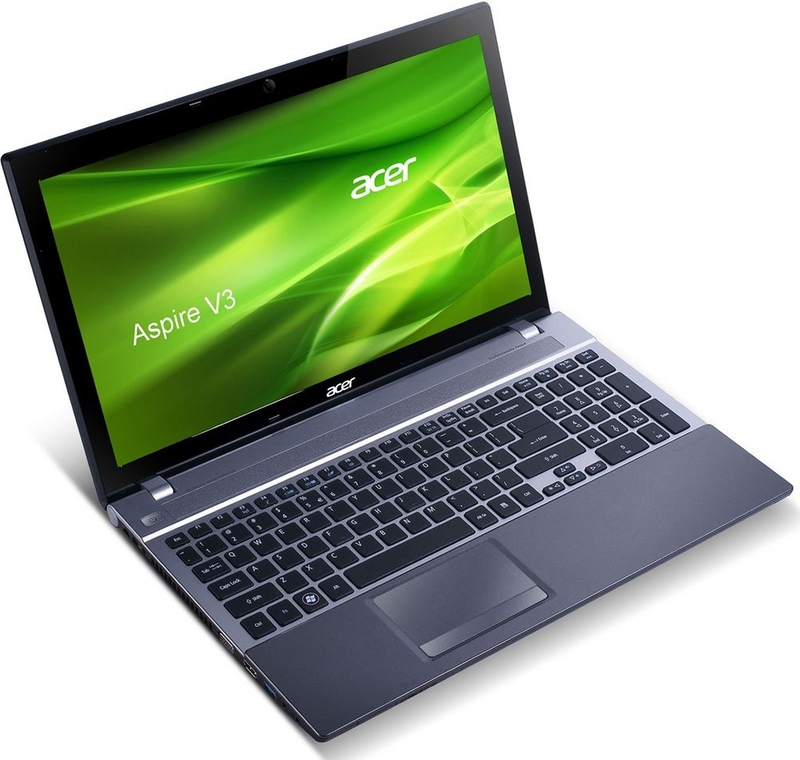 Connectivity, other features, input devices, and speakers correspond to the Acer Aspire V3-771G-7361161.12TBDCakk's. Therefore, we will concentrate on the small, but important differences, in particular the FHD display. The 17.3-inch anti-glare Acer ComfyView display stems from AUO and features a native resolution of 1920x1080 pixels (Full HD). The IPS panel convinces with wide viewing angles, rather high contrast and a very bright LED backlight. In contrast, the 1600x900 pixels resolution of the V3-771G-53234G50Maii predecessor is especially disappointing, as its Blu-ray drive can deliver 1080p content. Similar competitors, e.g. Dell's Inspiron 17R-SE-7720, MSI's GE70-i789W7H or Samsung's series 7 Chronos 700Z7C also feature Full HD displays. The average brightness of 325.1 cd/m² and the distribution of brightness of 84% are decent. 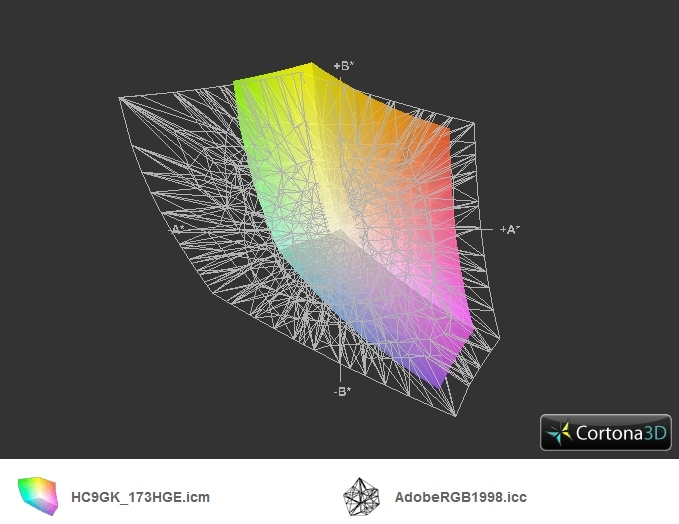 We appreciate the low black value of 0.34 cd/m². So, black appears deep black and not gray in movies, images, and games. The low black value brings about a very good contrast of 953:1 and so colorful pictures. The competitors cannot quite keep up here, although their black values are on a similar level: Dell Inspiron 17R-SE-7720 (black value: 0.35 cd/m², contrast: 726:1), MSI GE70-i789W7H (black value: 0.39 cd/m², contrast: 679:1) and Samsung Series 7 Chronos 700Z7C (black value: 0.3 cd/m², contrast: 870:1). In terms of color representation the V3-771G-736B161TMaii does not belong to the best, but it is still passable. It can nearly completely cover sRGB, but fails to cover AdobeRGB. The following figures depict the color analysis of the i1 Pro 2 photo spectrometer and the CalMAN 5 software (target: sRGB). With factory settings, gray levels are not represented accurately: DeltaE(2000) of 10. After calibration it falls to 6. A DeltaE of above 3 means that the human eye can see differences. Therefore, values below 3 would be ideal. The strong blue hue in non-calibrated state is striking. Magenta and cyan appear too bluish. In addition, yellow and red have a high DeltaE(2000) of 8 and 7. The last picture, color saturation after calibration, shows how useful a color calibration with appropriate hardware can be. 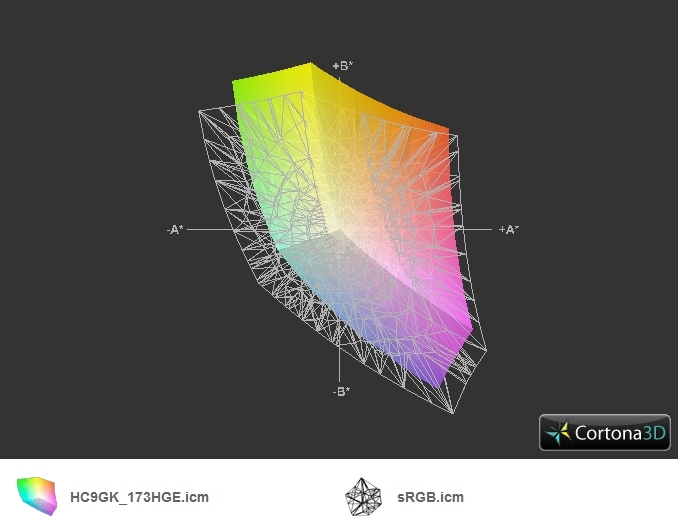 The blue hue nearly completely disappeared and apart from yellow all colors are accurately represented in the sRGB color space (DeltaE < 3). Now the result is similar to the V3-571G's Full HD panel and colors look warm. An anti-glare display is most important for comfortable viewing in direct and indirect sunlight. Because of the throughout good display properties, the display content remains clearly readable regardless of the viewing angle. Because of the anti-glare display, the viewing angles are excellent in horizontal direction. The image remains also recognizable at extreme viewing angles without color deviations or darkening. In a vertical direction, the image changes significantly sooner. 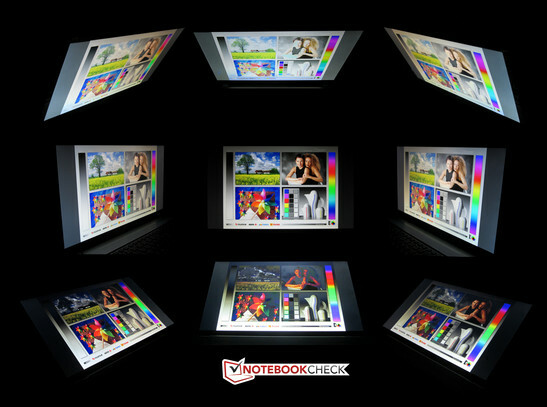 Depending on the viewing angle, the display content either looks darker or brighter. 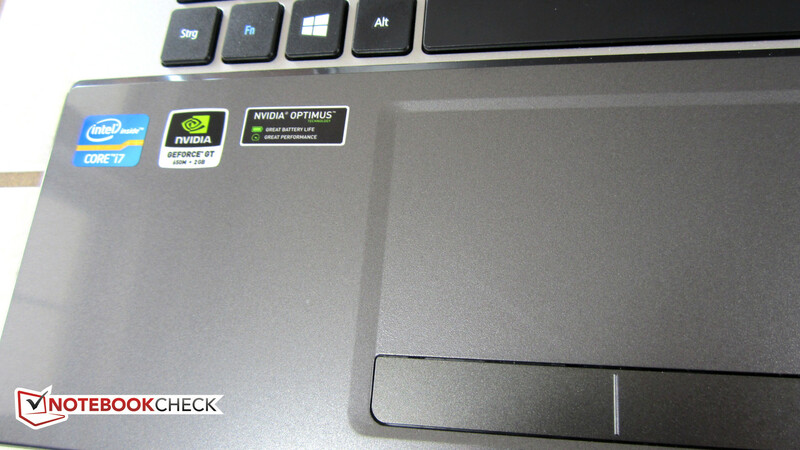 The Acer Aspire V3-771G-736B161TMaii and its predecessor have about the same field of application. Instead of an i7-3610QM quad core Ivy Bridge CPU, our test model features an Intel i7-3630QM, which is just marginally faster. 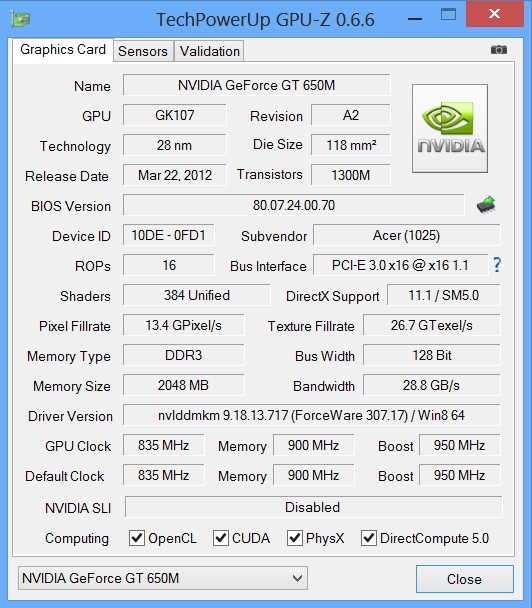 The GT 650M graphics card from Nvidia remained unchanged. 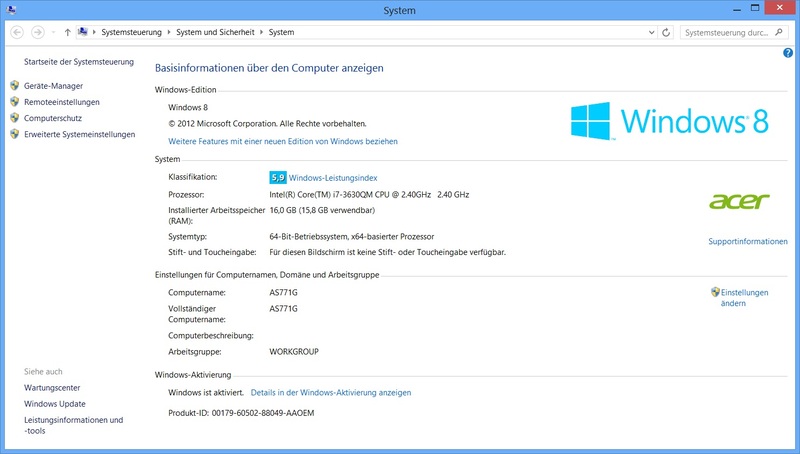 In addition, the test model comes with 16 GB RAM, 1 TB Toshiba MQ01ABD100 hard drive, and preinstalled Windows 8. 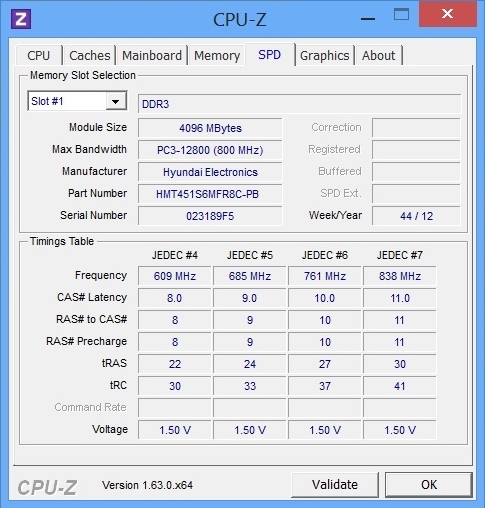 We use Cinebench R11.5 to evaluate the CPU performance: Because of the marginally faster CPU, the test model is slightly faster than the Aspire V3-771G-7361161.12TBDCakk in this test. While the Acer Aspire V3-771G-7361161.12TBDCakk model with SSD + HDD delivers a very high system performance, the Aspire V3-771G-736B161TMaii only features a conventional hard drive. 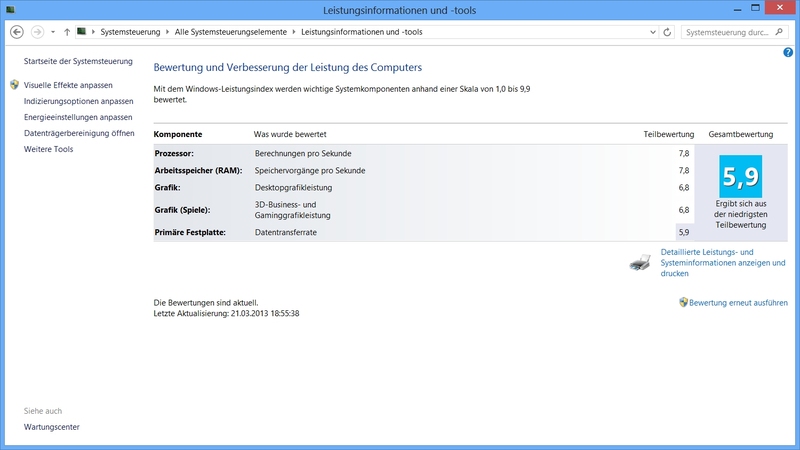 In the Windows 8 performance index, the negative impact gets apparent: The Toshiba HDD is the slowest component of the notebook and limits the system performance. Compared to similar notebooks like the Asus N76VZ-V2G-T1011V or the Dell Inspiron 17R-SE-7720 the Aspire V3 nevertheless performs well and Windows runs fast. 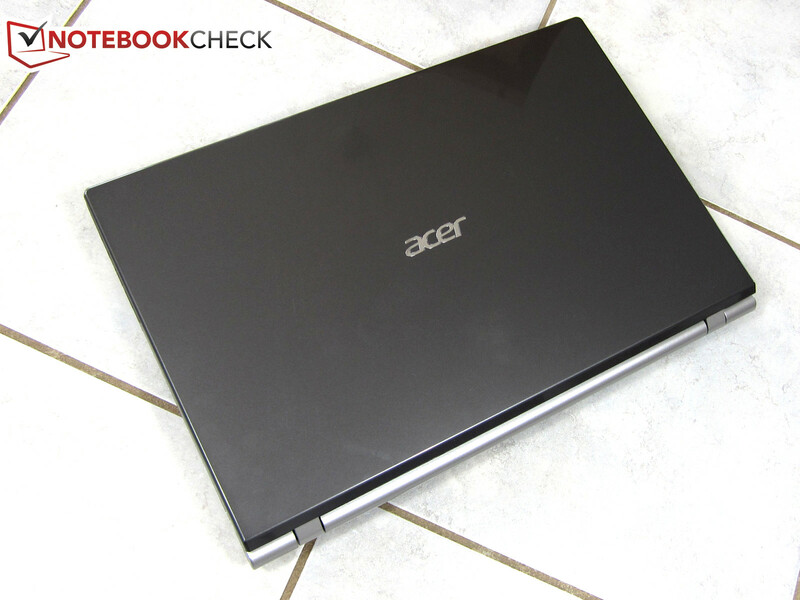 Our Acer test model uses a Toshiba MQ01ABD100 with a capacity of 1 TB. The data is stored on two 500 GB platters, which work with a revolution speed of 5,400 rpm. 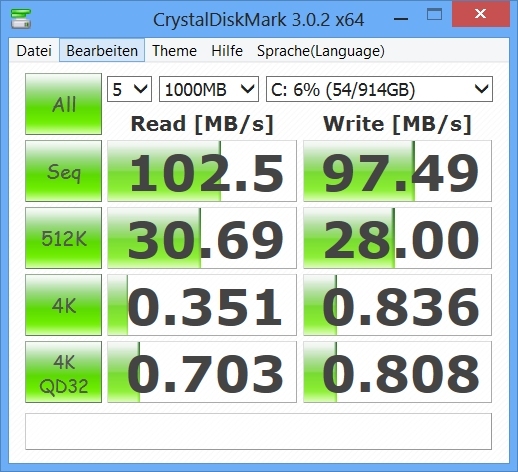 So, the average access time of 18.2 is rather slow and the SATA drive is not designed for high performance. 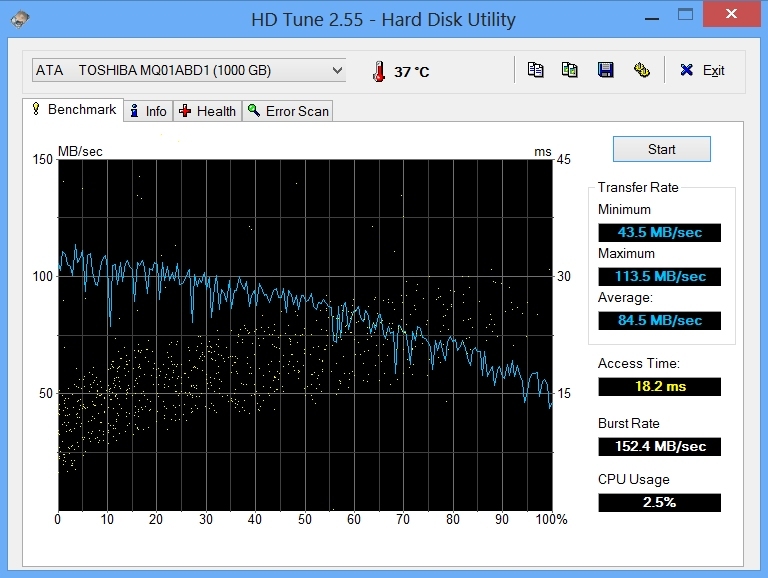 Nevertheless, the performance is decent: The Toshiba HDD achieves an average transfer rate of 84.5 MB/s. However, the system performance would be better with an SSD. 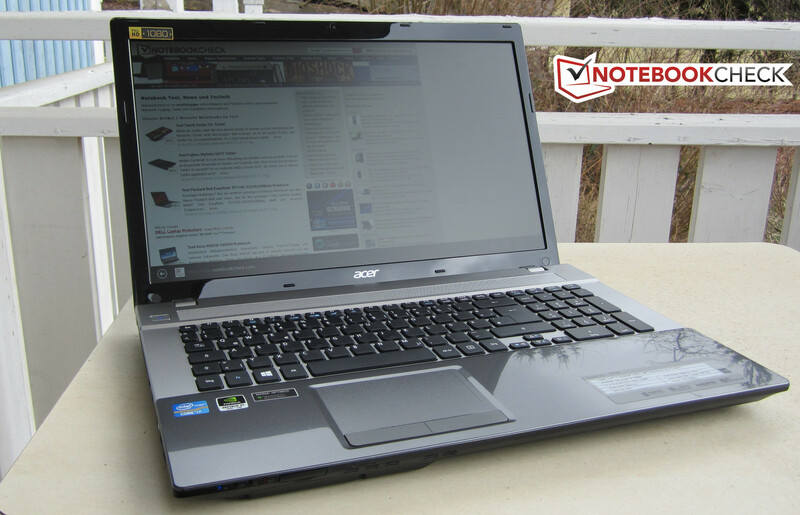 The Acer Aspire V3 comes with Nvidia's GeForce GT 650M, which features 2 GB DDR3 memory. 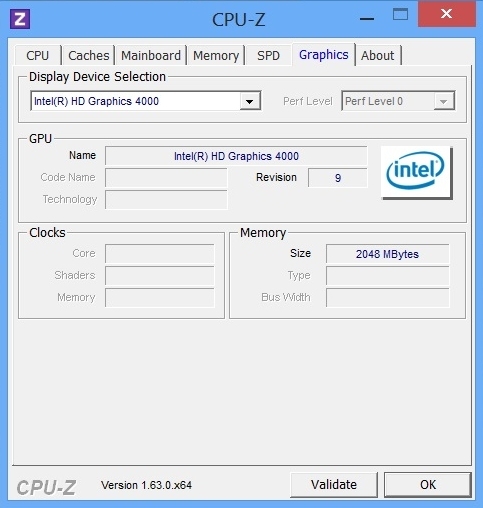 Thanks to Nvidia Optimus, the Intel HD Graphics 4000 integrated in the CPU can be used alternatively. The laptop automatically switches the graphics card without user intervention and an icon in the task bar shows the active GPU. 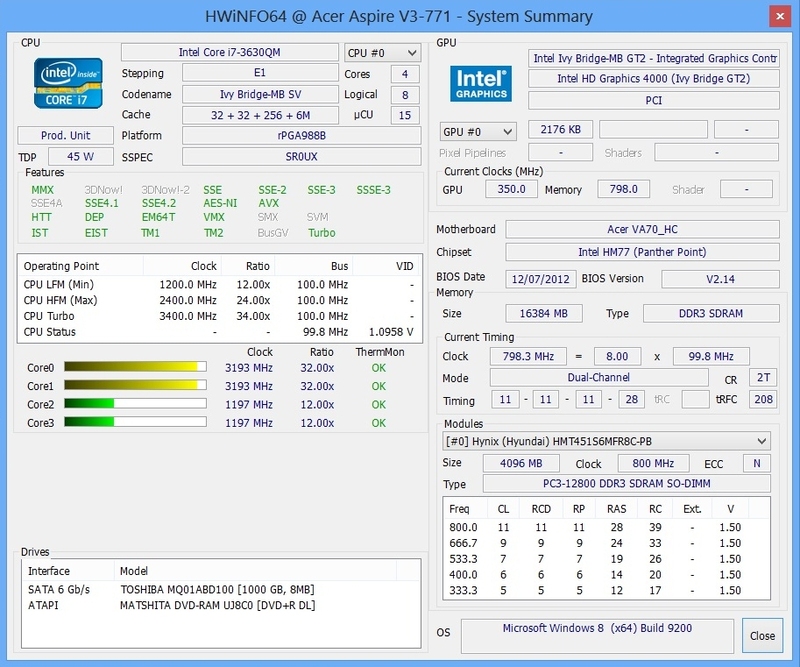 The same as for the Aspire V3-771G-7361161.12TBDCakk is also true for our test model: Acer promise "highest performance and quality" and this is not an exaggeration. 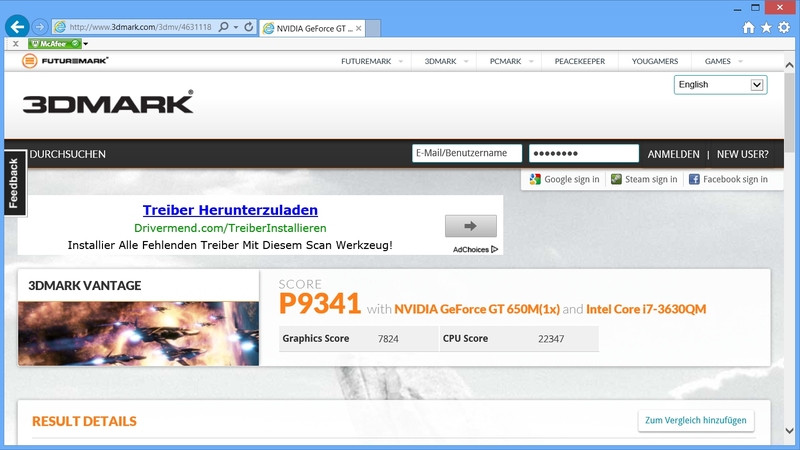 With a very good score of 2,410 points in 3DMark 11, the Aspire V3-771G-736B161TMaii's performance also suffices for current games, although the laptop quickly reaches its limits with highest details. While the Acer Aspire V3-771G-736B161TMaii does not deliver top gaming performance, its performance suffices for playing current games in medium to high resolution and details smoothly. However, the tested games notably stutter when the highest details are selected. Our benchmark list of mobile GPUs shows how Nvidia's GeForce GT 650M performs compared to other graphics cards. Despite its decent performance the Acer Aspire V3-771G-736B161TMaii remains quiet. While idle the laptop reaches 33.6 dB(A) and mainly remains unobtrusive during everyday tasks like web surfing, office, and multimedia use. However, a quiet fan noise is still audible. Under load the fan revs up and for example reaches a highly acceptable 38.3 dB(A) during gameplay. Under full stress - unlikely in practice - the Acer Aspire V3 becomes louder and the noise level of 41.6 dB(A) gets clearly audible. All things considered, the test model is slightly quieter than the Acer Aspire V3-771G-7361161.12TBDCakk with a maximum noise level of 44.6 dB(A). While idle the Acer Aspire V3 remains very cold. At a usual room temperature of 22 °C, we measure a maximum of 29.1 °C. After a one hour stress test the upper side of the laptop reaches up to 45.6 °C while the underside remains cool with a maximum of 38.5 °C. In our stress test, 100 °C proves to be the maximum core temperature. 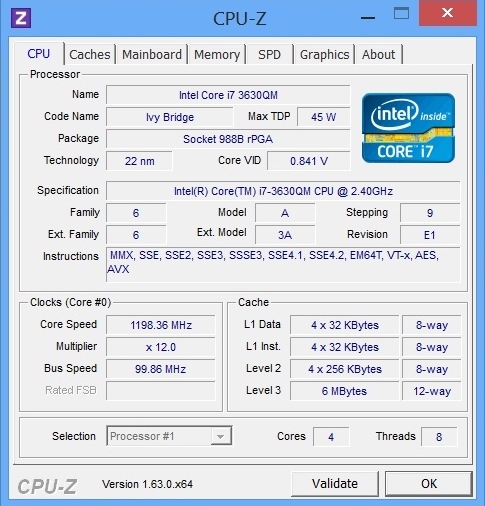 Once the limit is reached, the processor clocks down to 1.2 GHz. 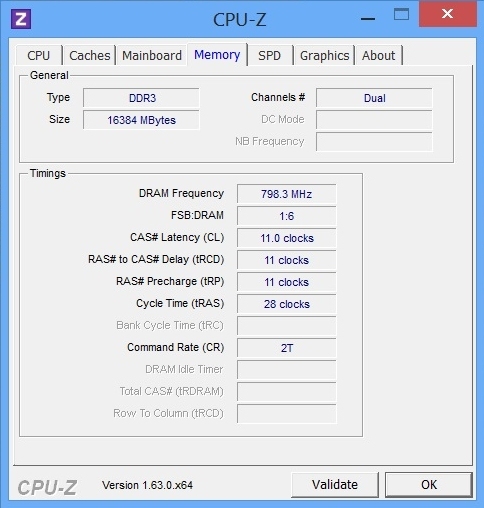 As soon as the temperatures falls, the clock increases to 3.2 GHz, the maximum turbo clock for 4 cores, again. 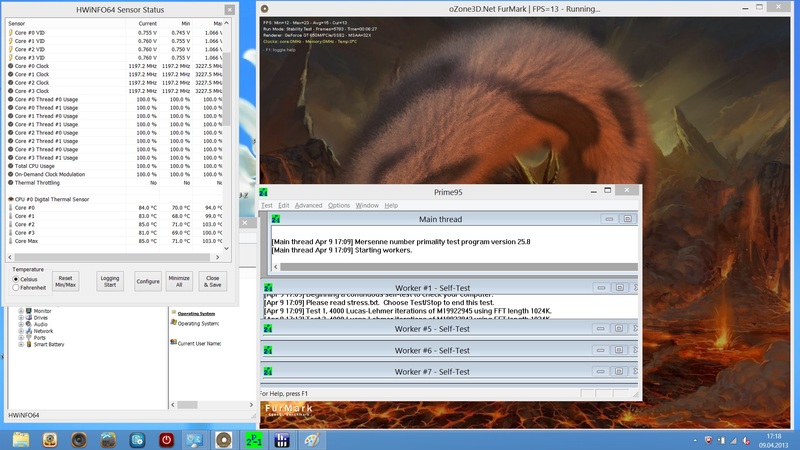 In order to find out whether you'll also experience downclocking in realistic scenarios, we ran a 3DMark 2006 benchmark immediately after the stress test. The difference compared to the cold state is within measurement errors. Therefore, thermal throttling is not to be expected during everyday tasks and games. The Acer Aspire V3 produces a decent sound, which is, due to the lack of strong basses, partly a little bit thin. 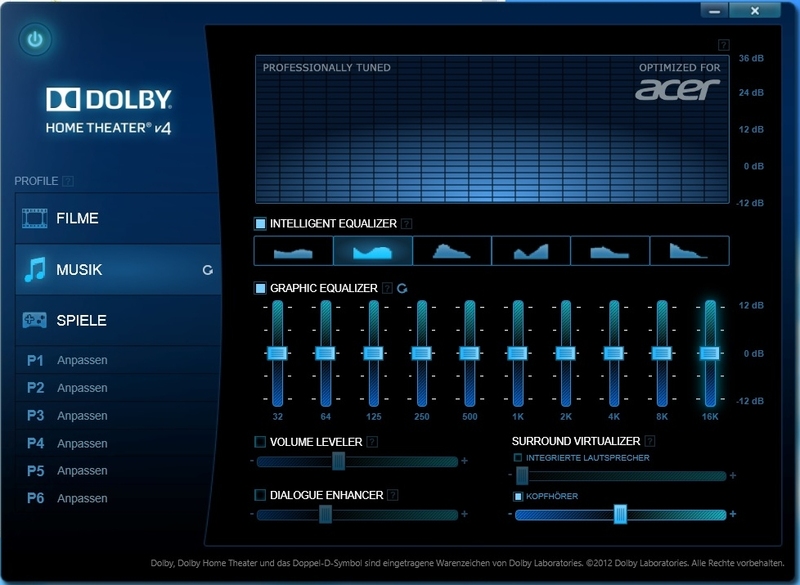 In order to improve the sound for films, music and games, it is recommended to use the preinstalled Dolby Home Theater software. While the powerful notebook runs idle, the energy demand between 9.1 Watt and 17.2 Watt remains low. If the CPU and GPU are used to capacity, the power consumption of the Acer Aspire V3 increases up to 122.1 Watt and reaches the limits of the 120 W power adapter. 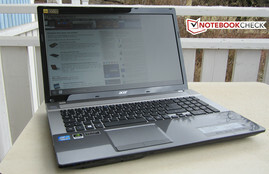 Compared to the Acer Aspire V3-771G-736B161TMaii predecessor, the battery is overall slightly shorter. This might be caused by the significantly brighter display with higher resolution, as battery capacity, power consumption and other core components like CPU and GPU do not, or only insignificantly, differ. In the best case (minimum display brightness, disabled Wi-Fi modules, energy saving profile), the 48 Wh battery delivers a maximum runtime of 3 hours 33 minutes. This is in line with the manufacturer's information, which quotes 3.5 hours. In our WLAN test with reduced brightness of 150 cd/m² and a looping script loading web pages, the laptop achieves a battery life of 2 hours 2 minutes. Under high load (Battery Eater Classic test) the battery is already empty after 52 minutes. 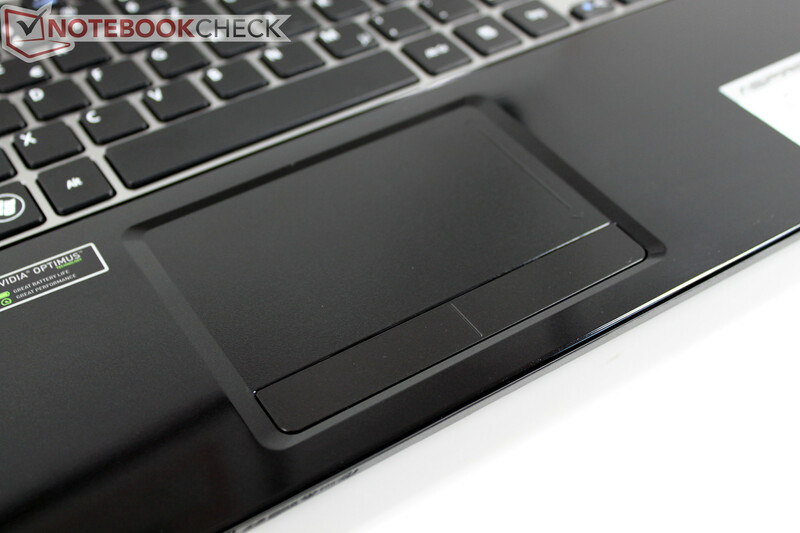 We found the Acer Aspire V3-771G-7361161.12TBDCakk lacking a Full HD display. The Acer Aspire V3-771G-736B161TMaii successor fixed this shortcoming: The 1920x1080 pixel LC display of the 17.3-incher is very bright, contrast-rich and convinces with wide viewing angles. 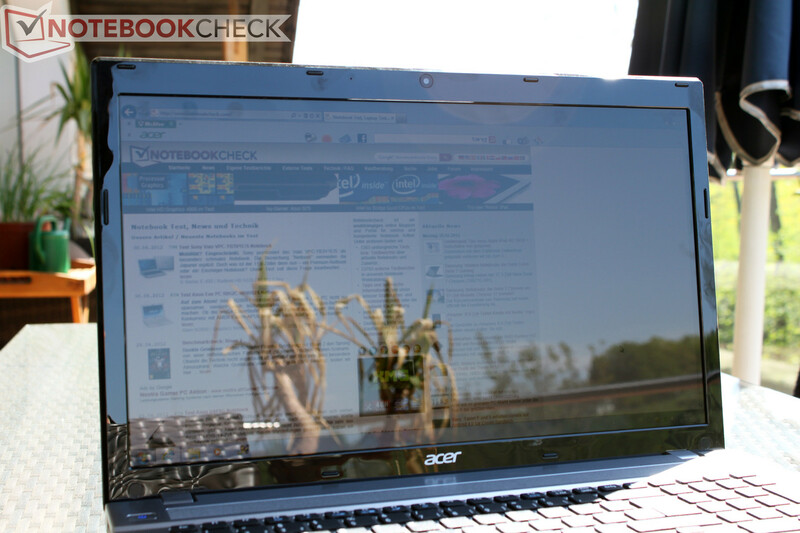 While the predecessor featured a glare-type display, the Acer now comes with an anti-glare screen. In addition, the case no longer has a piano black finish. However, the display with higher resolution slightly decreases the battery life. A completely successful update? Not quite! 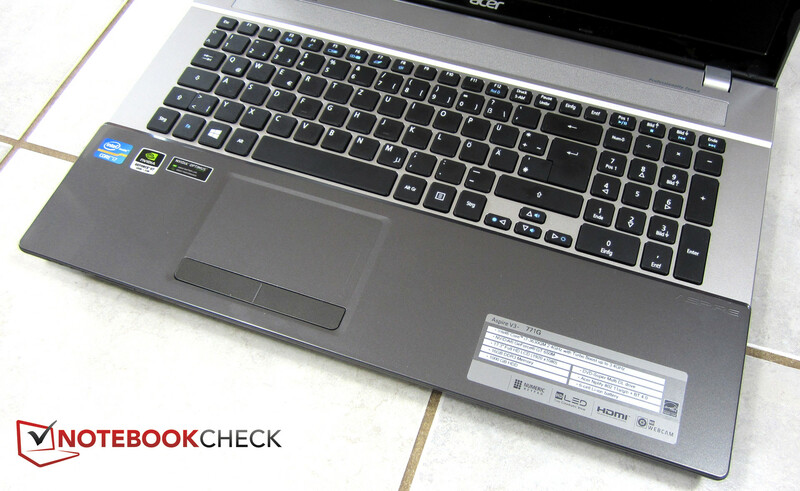 The Acer Aspire V3-771G-736B161TMaii unfortunately lacks a Blu-ray drive, which is a clear drawback for a multimedia notebook. 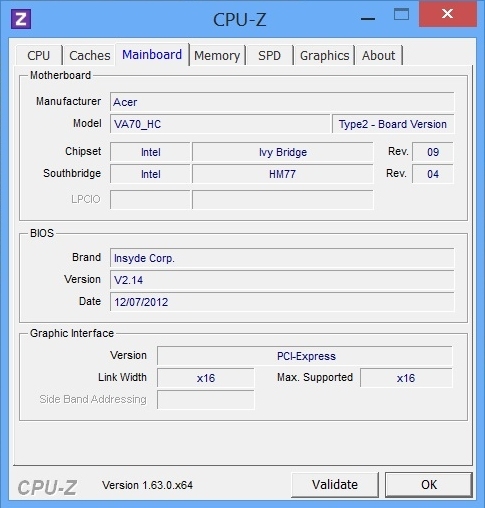 In addition, the test model cannot reach the very fast system performance of the Aspire V3-771G-7361161.12TBDCakk, although it is equipped with nearly the same CPU (Intel Core i7-3630QM instead of Core i7-3610QM): Instead of the fast SSD / HDD combination of its predecessor the V3-771G-736B161TMaii only features a conventional hard drive. But, the gaming performance is still decent. We would like to see a third update based on the Acer Aspire V3-771G-7361161.12TBDCakk predecessor, but with Full HD display. Together with an SSD boot drive, an additional hard drive for storing data and a Blu-ray drive, it would deliver everything a multimedia device needs. 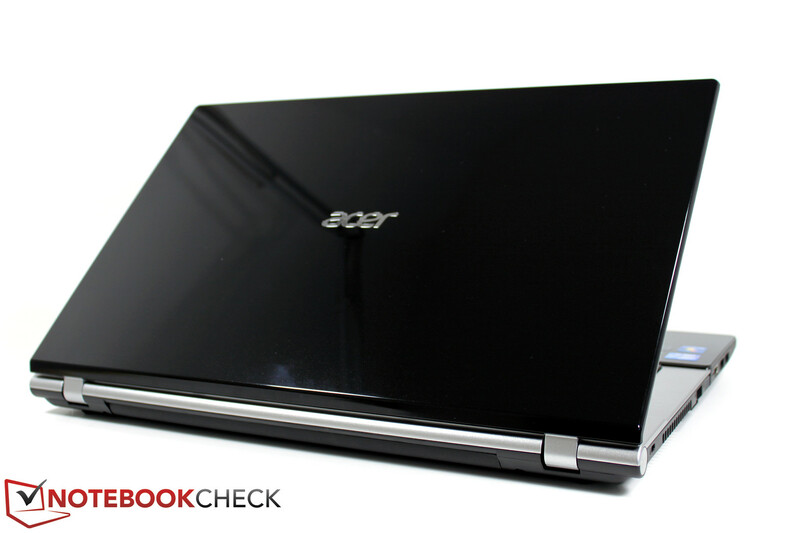 The Acer Aspire V3-771G-736B161TMaii features a Full HD display. ... and a glossy lid. 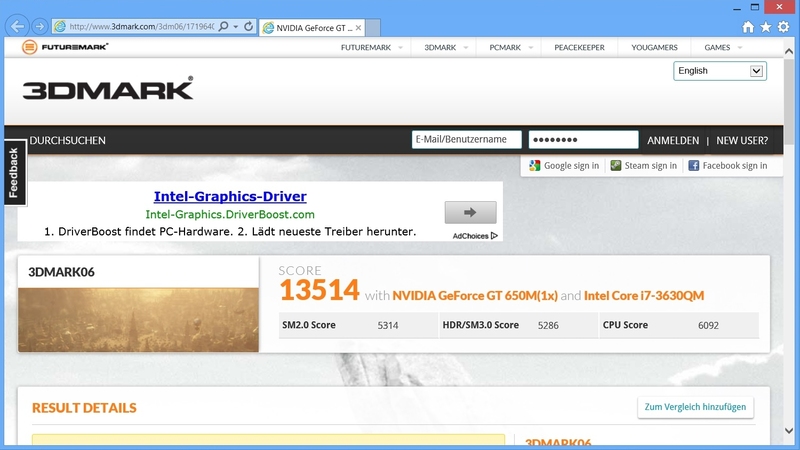 CPU and GPU: Intel i7-3630QM and Nvidia GeForce GT 650M. Same case shape for all Aspire V3 models. 16 GB RAM, but no SSD and no Blu-ray drive. matte surfaces instead of piano black finish. A fast SSD HDD works inside. 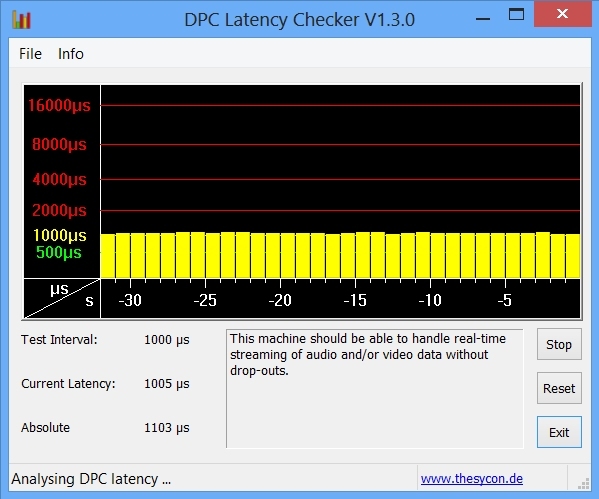 The Dolby Home Theater Software improves the sound. The Acer offers a lot of performance reserves and can also run current games, but not at maximum details and resolution. A Blu-ray drive to meet its multimedia claim and an SSD, which would make the Aspire V3-771G-736B161TMaii even faster. 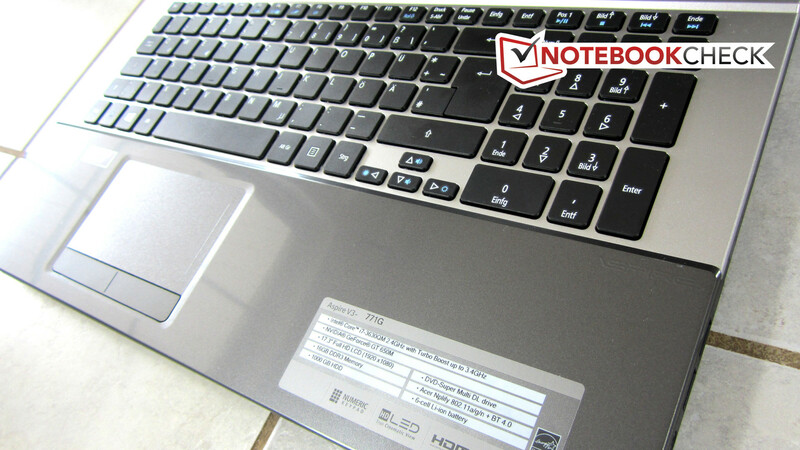 The Acer Aspire V3-771G-7361161.12TBDCakk predecessor shows how to do it right. The relatively low temperature increase. The device also remains rather cool during maximum load. 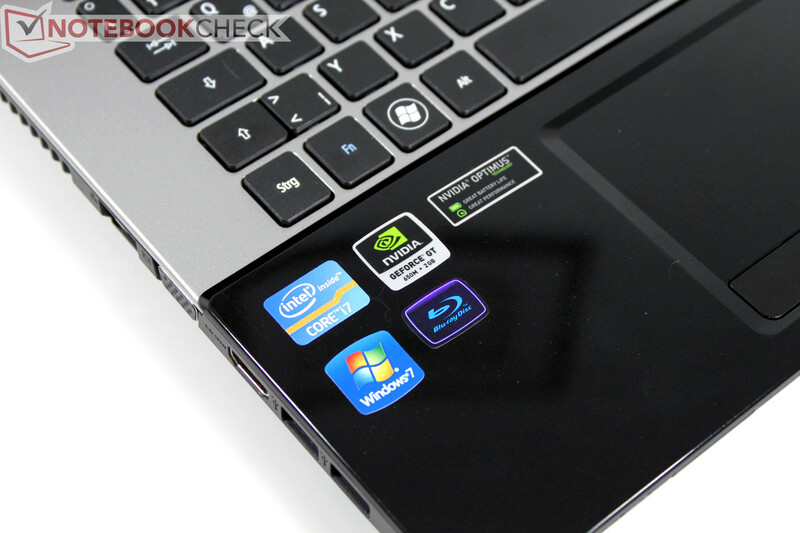 Multimedia and gaming notebooks based on Ivy Bridge in 17-inch with a similar CPU and GPU. 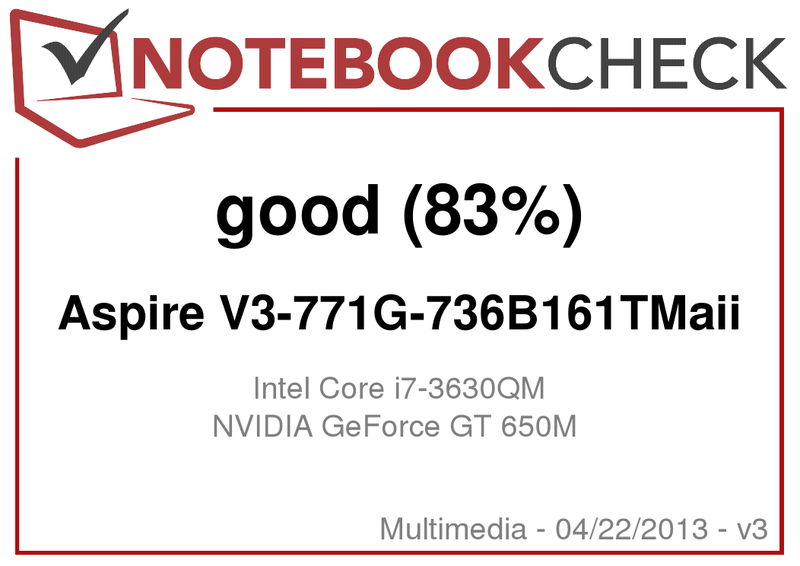 The following Ivy Bridge laptops use the same Nvidia GeForce GT 650M graphics card as the Acer Aspire V3-771G-736B161TMaii: Asus N76VZ-V2G-T1011V, Dell Inspiron 17R-SE-7720, MSI GE70-i789W7H, and Samsung Series 7 Chronos 700Z7C.